Sen. Marco Rubio (R-Fla.) and his staff have been booted out of his office in Tampa because of continued weekly protests outside the building. The owner of the Bridgeport Center, which has been renting the space to Rubio since 2014, has decided to not renew the lease because rallies have cost the company money and have become too disruptive for other tenants, Jude Williams, president of America’s Capital Partners, told the Tampa Bay Times. Williams said he understands the protesters’ cause, but the demonstrations have become a security concern. He did not return a call from The Washington Post on Wednesday. The office needs to be emptied by Thursday, and it appears the senator has yet to find new headquarters in Tampa. “We are actively looking for new office space, and our goal is to remain accessible and continue to provide prompt and efficient service to all Floridians,” Christina Mandreucci, Rubio’s spokeswoman, said in a statement. Until then, constituents in need of assistance can call 866-630-7106 to reach a representative, Mandreucci said. Rubio, whose other Florida offices are in Miami, Orlando, Jacksonville, Pensacola, Tallahassee and Palm Beach, has been leasing the space on a monthly basis since the annual lease expired in December. His office unsuccessfully negotiated for a renewal, and recent talks with another company have fallen through. Protesters opposing President Trump’s policies have shown up outside Rubio’s Tampa office since the president took office. They said they’ll show up every week for the first 100 days of Trump’s presidency. The building management has placed barricades and assigned security guards in and around the area, according to the Tampa Bay Times. Demonstrators holding #NoWall and #NoBan signs also have shown up at Rubio’s Miami office, the Miami Herald reported. Many of the protesters are part of the national Indivisible movement started by former congressional staffers from the Obama administration. The idea behind it is to rally activists — individuals, groups and organizations — to oppose Trump at the local level and to place pressure on their representatives in Congress. The former congressional staffers wrote the “Indivisible Guide,” which outlines “advocacy tactics,” such as showing up at town halls, public events and district headquarters. “The guide is intended to be equally useful for stiffening Democratic spines and weakening pro-Trump Republican resolve,” according to Indivisible’s website. The movement’s founders wrote in a recent New York Times column that they took “a few pages from the Tea Party playbook.” The Tea Party movement, they wrote, used local mobilization to resist former president Barack Obama’s agenda. Similar things have been happening at town halls and district headquarters over the past weeks. Republicans who went back to their home turf have been dogged by angry crowds. Many, citing safety concerns, have refused to hold town hall meetings. Specifically mentioning the “Indivisible Guide,” he said protesters were instructed to show up and occupy the front rows. Rubio, who tweeted in 2009 about the importance of anger at town halls, didn’t show up at a recent South Miami-Dade County event attended by more than 200 people, according to the Miami New Times. His seat was replaced with an empty suit. 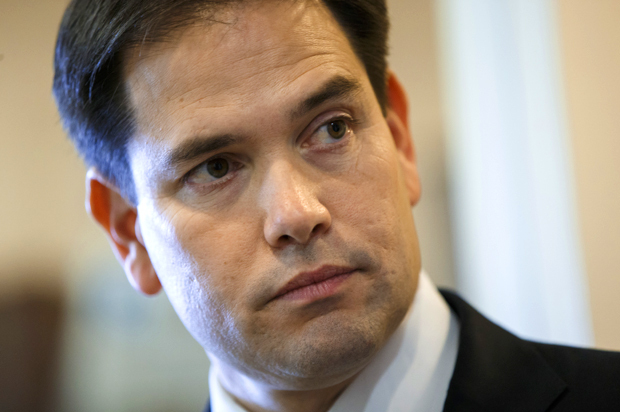 Mandreucci, the spokeswoman, said Rubio’s staff has met with “hundreds of liberal activists” across Florida. Michael Broache, co-founder of Indivisible Tampa, said the senator’s staff has been polite and accommodating to constituents, according to the Tampa Bay Times. He said the group didn’t intend for Rubio to get booted out of his headquarters. The Post was unable to reach Broache Wednesday. A must-read morning briefing for decision-makers.